The village of Roquefort is built into the side of the limestone Combalou mountains in Southern France which are riddled with caves. The cheese continues to be ripened in these caves to this day. They are also the source of the natural blue mould Penicillium roqueforti. A classic accompaniment to sweet wines, such as Sauternes, you could also enjoy a slither of Roquefort in a steak and rocket sandwich for a decadent lunch. 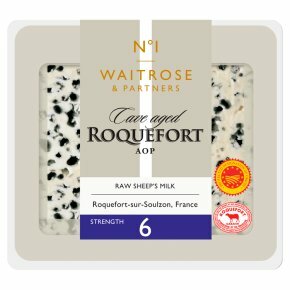 An Iconic Roquefort, spicy with a salty finish, made with ewe's milk and aged in limestone caves. INGREDIENTS: Roquefort cheese (ewe's milk).